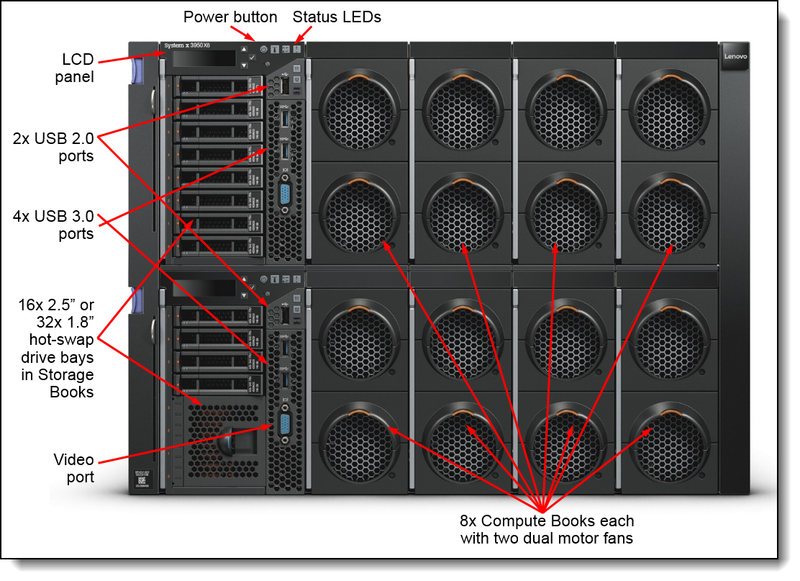 The Lenovo System x3950 X6 server, machine type 6241, is an eight-socket 8U rack-mounted server that represents the sixth generation of the Enterprise X-Architecture. Now with Intel Xeon E7 v4 processors, the x3950 X6 delivers fast application performance, is based on an agile system design, and is a resilient platform that is needed for mission-critical databases, enterprise applications, and virtualized environments. This product guide provides essential pre-sales information to understand the x3950 X6 server, its key features and specifications, components and options, and configuration guidelines. This guide is intended for technical specialists, sales specialists, sales engineers, IT architects, and other IT professionals who want to learn more about the x3950 X6 and consider its use in IT solutions. 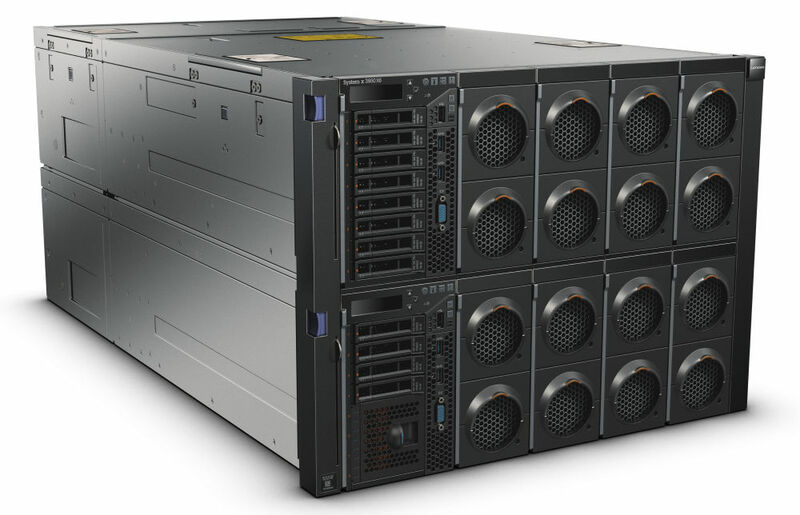 The x3950 X6 packs numerous fault-tolerant and high-availability features into a high-density, 8U rack-optimized lid-less package that helps reduce the space that is needed to support massive network computing operations and simplify servicing. The x3950 X6 supports up to eight Intel Xeon E7 processors and up to 24 TB of memory. Suggested use: mission-critical scalable databases, business analytics, virtualization, enterprise applications, and cloud applications. 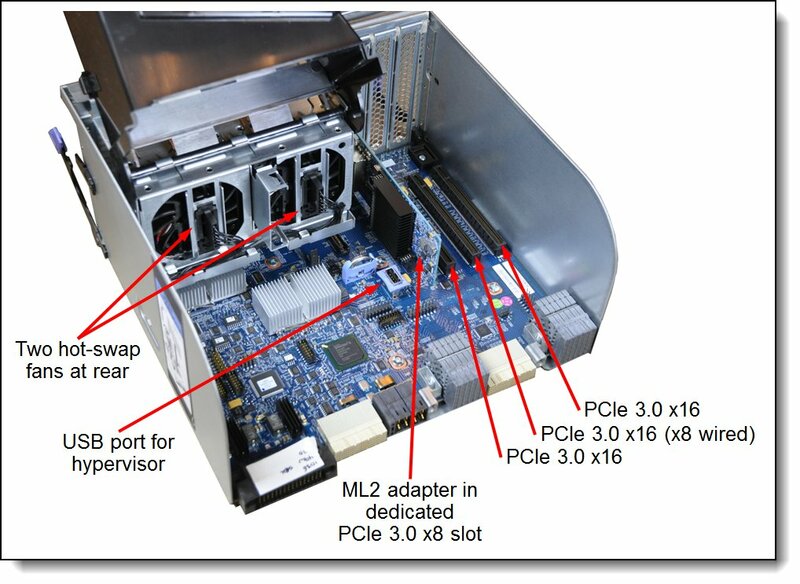 The x3950 X6 server employs a lid-less design where all serviceable components are front- and rear-accessible. In addition, each major subsystem is implemented as modular "book" design, such as the Compute Books and I/O Books. This configuration means that components are easy to upgrade and service, which translates to greater uptime of applications to your users. The x3950 X6 offers enterprise scalability and advanced RAS features to support the most demanding mission-critical applications that require 24x7 operations. The increasing demand for cloud-computing and analytics workloads by enterprises to meet social, mobile, and Big Data requirements drives innovation to find new ways to build informational systems. Clients are looking for cost-optimized fit-for-purpose IT solutions that manage large amounts of data, easily scale performance, and provide enterprise class reliability. Fast application performance means immediate access to actionable information. Agile system design helps to reduce acquisition costs and provide the ability to upgrade processor and memory technology at each refresh within the same chassis. Resilient platforms maximize application uptime and promote easy integration in virtual environments. X6 servers continue to lead the way as the shift toward mission-critical scalable databases, business analytics, virtualization, enterprise applications, and cloud-computing applications accelerates. Supports up to eight E7 v4 processors with a total of 192 cores and 384 threads to maximize the concurrent running of multi-threaded applications. Improves productivity by offering superior system performance with processors up to 24 cores, core frequencies up to 3.2 GHz core speeds, L3 cache of up to 60 MB, and three QPI interconnect links at up to 9.6 GTps. Supports up to 192 DIMM sockets, with 24 DIMMs per processor. Intel Hyper-Threading Technology boosts performance for multi-threaded applications by enabling simultaneous multi-threading within each processor core, up to two threads per core. Intel Advanced Vector Extensions (AVX) improves floating-point performance for compute-intensive technical and scientific applications. Supports a 12 Gbps SAS RAID portfolio. The usage of solid-state drives (SSDs) instead of, or along with, traditional spinning drives (HDDs) can improve I/O performance. An SSD can support up to 100 times more I/O operations per second (IOPS) than a typical HDD. Optional support for high-performance PCIe-attached NVMe Flash Storage solid-state drives (SSDs) can significantly improve I/O performance. PCI Express 3.0 I/O adapter slots that improve the theoretical maximum bandwidth by almost 100% (8 GTps per link using 128b/130b encoding) compared to the previous generation of PCI Express 2.0 (5 GTps per link using 8b/10b encoding). With Intel Integrated I/O Technology, the PCI Express 3.0 controller is integrated into the Intel Xeon processor. This integration helps reduce I/O latency and increase overall system performance. Support for up to four graphics processing units (GPUs) and co-processors to maximize computing power. Energy-efficient electronic components help lower operational costs, including highly efficient 900 W AC and 1400 W AC power supplies with 80 PLUS Platinum certification. Innovative module "book" design for each of the three subsystems: Compute Books, Storage Book, and I/O Books. Front and rear access means that you can easily scale the system by adding components without removing the entire server from the rack. The modular book design also allows clients to create the configuration that fits their application and environment needs, which reduces acquisition costs while giving them the flexibility to grow and modify their configuration later. The book design also means that subsystem upgrades are simpler, quicker to perform, and have a lower impact on the rest of the server. Using 128 GB 3DS RDIMMs, the server supports up to 24 TB of memory. Up to 32x 1.8-inch SSD bays, or up to 16x 2.5-inch bays, provide a flexible and scalable all-in-one platform to meet your increasing demands. 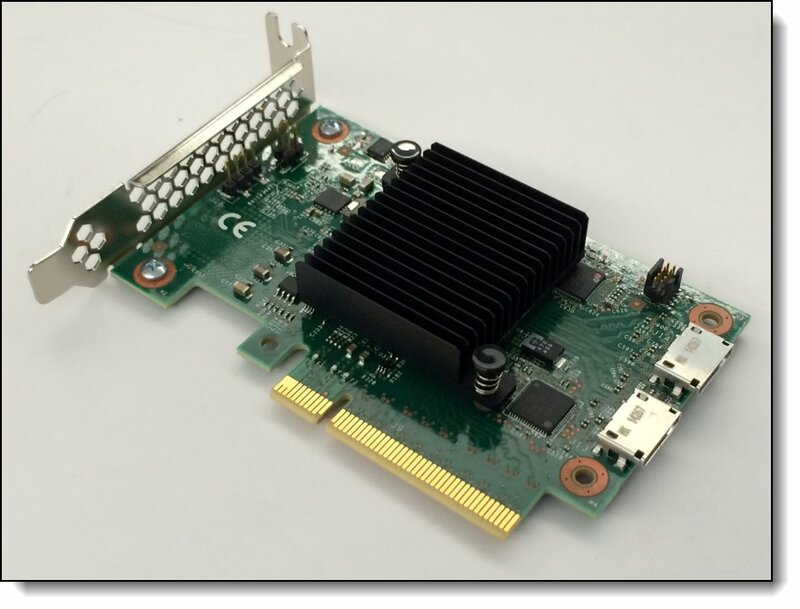 Offers up to 22 PCIe slots plus two dedicated Mezzanine LOM (ML2) adapter slots. Most slots are PCIe 3.0 to maximize I/O scalability. 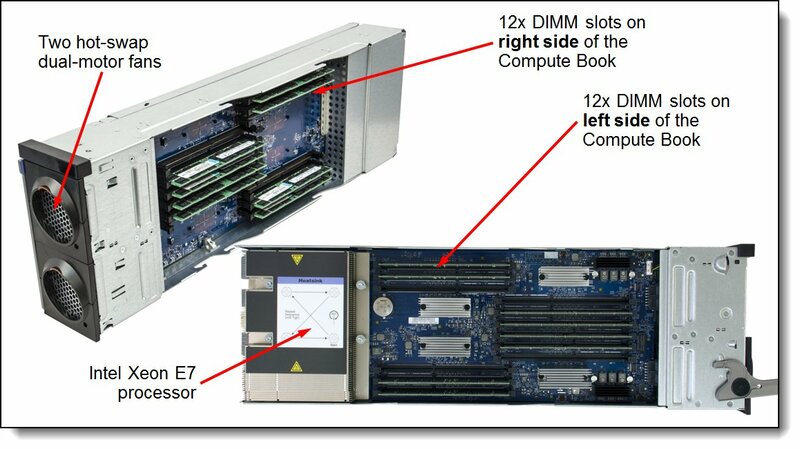 PCIe slots are implemented in I/O Books to maximize modularity. Choose from Half-length I/O Books or Full-length I/O Books, depending on the adapters that you need to deploy. Most components are common between the four-socket x3850 X6 and eight-socket x3950 X6, making for a simple upgrade path with minimal parts on the floor. Upward Integration Modules for standard hypervisors enable the creation and management of policies to maintain high availability of virtual machines and concurrent updating of the system firmware, with no impact on application performance or availability. Advanced Processor Recovery allows the system to automatically switch access and control of networking, management, and storage in the event of a processor 1 failure, providing higher availability and productivity. Advanced Page Retire proactively protects applications from corrupted pages in memory, which is crucial for scaling memory to terabytes. Redundant bit steering, memory mirroring, and memory rank sparing for redundancy in the event of a non-correctable memory failure. Intel Execute Disable Bit functionality can help prevent certain classes of malicious buffer overflow attacks when combined with a supported operating system. Intel Trusted Execution Technology provides enhanced security through hardware-based resistance to malicious software attacks, allowing an application to run in its own isolated space, which is protected from all other software running on a system. Redundant Intel Platform Controller Hub (PCH) connections to the processors allow the platform to maintain access to networking, storage, and server management during a processor failure. Hot-swap drives support RAID redundancy for data protection and greater system uptime. Hot-swap I/O Books enabling you to install or replace adapters while the server is still running. Tool-less lid-less design provides front and rear access for easy upgrades and serviceability. There is no need to pull the server out of the rack to access internal components. Hot-swap power supplies and hot-swap dual-motor redundant fans provide availability for mission-critical applications. An LCD diagnostics panel that is combined with individual light path diagnostic LEDs quickly lead the technician to failed (or failing) components, which simplifies servicing, speeds up problem resolution, and helps improve system availability. Proactive Platform Alerts (including PFA and SMART alerts): Processors, voltage regulators, memory, internal storage (SAS/SATA HDDs and SSDs, NVMe SSDs, flash storage adapters), fans, power supplies, RAID controllers, and server ambient and sub-component temperatures. Alerts can be surfaced through the system IMM to managers such as Lenovo XClarity Administrator, VMware vCenter, and Microsoft System Center. These proactive alerts let you take appropriate actions in advance of possible failure, thereby increasing server uptime and application availability. Built-in Integrated Management Module Version II (IMM2) continuously monitors system parameters, triggers alerts, and performs recovering actions in case of failures to minimize downtime. Includes two special Mezzanine LOM (ML2) adapter slots with support for adapters with either two 10 Gb ports or four 1 Gb ports. Supports direct connectivity to the IMM2 service processor for out-of-band systems management. Integrated Trusted Platform Module (TPM) supporting TPM 2.0 and TPM 1.2 enables advanced cryptographic functionality, such as digital signatures and remote attestation. Industry-standard Advanced Encryption Standard (AES) NI support for faster and stronger encryption. Lenovo XClarity Administrator provides proactive systems management. It offers comprehensive systems management tools that help increase uptime, reduce costs, and improve productivity through advanced server management capabilities. Solid-state drives (SSDs) offer better reliability than traditional mechanical HDDs for greater uptime. Built-in diagnostic tests, using Dynamic Systems Analysis (DSA) Preboot, speed up troubleshooting tasks to reduce service time. Three-year customer-replaceable unit and onsite limited warranty, 9x5 next business day. Optional service upgrades are available. The following figure shows the front of the x3950 X6 server. 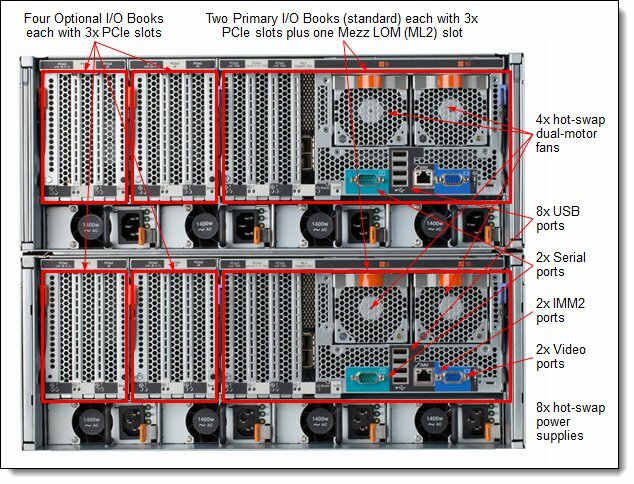 The following figure shows the rear of the x3950 X6 server. Processor Four, six or eight Intel Xeon E7-8800 v4 processors, each in a Compute Book. Processor options have between 4 and 24 cores with core frequencies up to 3.2 GHz. Three QPI links up to 9.6 GT/s each. Compute Books have TruDDR4 memory up to 1866 MHz, but cannot be mixed. Up to 60 MB L3 cache. Intel C602J chipset. Memory Up to 192 DIMM sockets (24 DIMMs per processor, installed in the Compute Book). RDIMMs and LRDIMMs (Load Reduced DIMMs) are supported, but memory types cannot be intermixed. Memory is either TruDDR4 memory (up to 1866 MHz) or DDR3 memory (up to 1600 MHz), depending on the Compute Book selected. DDR3 memory and TruDDR4 memory cannot be mixed in the same Compute Book. Compute Books with DDR3 memory and Compute Books with TruDDR4 memory cannot be mixed in the same system. 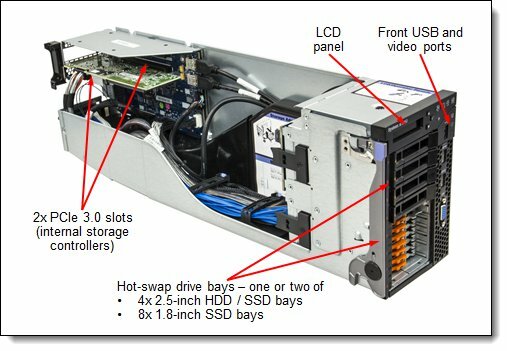 Disk drive bays Up to 32x 1.8" SSD bays, or up to 16x 2.5" hot-swap SAS/SATA bays, or up to 8x 2.5” hot-swap PCIe NVMe SSD drive bays. RAID support 12 Gb SAS/SATA RAID 0, 1, or 10 with ServeRAID M5210; optional upgrades to RAID 5 or 50 are available (zero-cache; 1 GB non-backed cache; 1 GB or 2 GB flash-backed cache). Upgrades to RAID 6 or 60 available for M5210 with 1 GB or 2 GB upgrades. Optical and tape bays No internal bays. See http://support.lenovo.com/en/documents/pd011281 for external DVD options. Network interfaces Mezzanine LOM (ML2) slots for dual-port 10 GbE cards with SFP+ or RJ-45 connectors or quad-port GbE cards with RJ-45 connectors. See Table 2. Dedicated 1 GbE port for systems management. Four optional I/O Books, each with three slots, all full height (using two requires 6 processors; using all four requires 8 processors). Optional books are hot-swap capable. Ports Front: Four USB 3.0, two USB 2.0, and one VGA video ports. Rear: Eight USB 2.0, two VGA video, two DB-9 serial, and two1 GbE RJ-45 IMM2 systems management. Internal: two USB 2.0 port for embedded hypervisor. The second video, IMM2, and internal USB hypervisor ports are used only when the server is partitioned into two four-socket servers. Cooling Calibrated Vectored Cooling™. Up to 20 redundant hot-swap fan packs and 10 fan zones with N+1 fan redundancy. Each fan pack includes two counter-rotated dual-motor fans. Power supply Up to eight redundant hot-swap 900 W AC or 1400 W AC power supplies (all 80 PLUS Platinum certified). -48 V 750 W DC power supplies are available through CTO. Security features Power-on password, admin password, and two Trusted Platform Modules supporting TPM 2.0 and TPM 1.2. Systems management UEFI, Integrated Management Module II (IMM2) with remote presence feature, Predictive Failure Analysis, Light Path Diagnostics, Automatic Server Restart, Lenovo XClarity Administrator, Lenovo XClarity Integrators, and ServerGuide. Service and support Optional service upgrades are available through Lenovo Services offerings: 4-hour or 2-hour response time, 8-hour fix time, 1-year or 2-year warranty extension, and remote technical support for Lenovo hardware and some Lenovo / OEM applications. This following table lists the standard models. † x in the Machine Type Model (MTM) represents a country-specific letter (for example, the EMEA MTM is 6241-BAG, and the US MTM is 6241-BAU). Ask a Lenovo representative for specifics. ** Processor detail: Processor quantity and model, cores, core speed, L3 cache, and TDP. ‡ All models include one Intel I350-T4 ML2 Quad Port GbE Adapter (I350-AM4 based). § Models with 12 slots have two Primary I/O Books (each with four slots) and two Storage Books (each with two slots) standard. Models with E7 v3 and E7 v2 processors: All models with E7 v3 and E7 v2 processors are now withdrawn from marketing. For more information about the standard features of the server, see the Standard specification section. The Lenovo System x3950 X6 Workload Optimized Solutions for SAP HANA provide optimal solutions for SAP NetWeaver Business Warehouse, data mart, and SAP Business Suite, Powered by SAP HANA applications. Preconfigured workload optimized server models for SAP HANA applications are configured with up to 2 TB of memory and are upgradeable to support larger single node and scale-out cluster implementations. The following table lists the Workload Optimized Solution models for SAP HANA. Note: The operating system software is not included with the SAP HANA models. Operating system selection must be a separate line item included in order: SLES for SAP with standard or priority support. The SAP HANA Software is included, but the license is sold separately by SAP or an SAP business partner. VMware Enterprise Plus license sold separately. IBM Spectrum Scale (GPFS) is available from Lenovo separately. 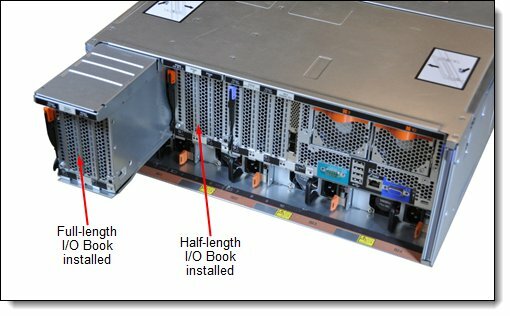 With the x3950 X6, machine type 6241, Lenovo supports upgrading the server processors by simply by replacing the Compute Books. The process to upgrade is made very simple because of the innovative book design of the x3850 X6. Upgrades to E7 v4 processors are only supported with machine type 6241. If you want to upgrade an X6 server with machine type 3837, contact your local representative. Intel Xeon E7 v4 processors require minimum firmware levels. Consult the documentation that is included with the Compute Books. If you upgrade from E7 v3 processors with DDR4 to E7 v4 processors, you can transfer the 2133 MHz DDR4 memory DIMMs to the new compute books. If you also want to add additional memory to the E7 v4 compute book, it is supported to use either 2133 MHz or 2400 MHz DDR4 memory DIMMs. It is supported to mix 2133 MHz and 2400 MHz DIMMs in the same compute book. The x3950 X6 supports four, six, or eight Compute Books. Other combinations are not supported. Each Compute Book is installed in the front of the server, as shown in the following figure. Note: Compute Books with E7-4800 processors are supported only in a four-socket x3850 X6 server and cannot be used in an x3950 X6 server. The table also shows the maximum memory bus speed each processor supports plus which server models have each processor standard. If there is no corresponding where-used model for a particular processor, this processor is only available through CTO. † The processors support two memory modes, RAS mode (also known as lockstep mode) and Performance mode (also known as independent mode). In Performance mode, the SMI2 link operates at twice the memory bus speed shown. The x3950 X6 (6241) supports either DDR3 or TruDDR4 memory, depending on the Compute Books used in the server. Lenovo TruDDR4 Memory uses the highest quality components that are sourced from Tier 1 DRAM suppliers and only memory that meets the strict requirements of Lenovo is selected. It is compatibility tested and tuned to maximize performance and reliability. TruDDR4 Memory has a unique signature that is programmed into the DIMM that enables System x® servers to verify whether the memory that is installed is qualified or supported by Lenovo. Because TruDDR4 Memory is authenticated, certain extended memory performance features can be enabled to extend performance over industry standards. Lenovo DDR3 memory is compatibility tested and tuned for optimal System x performance and throughput. Lenovo memory specifications are integrated into the light path diagnostics for immediate system performance feedback and optimum system uptime. From a service and support standpoint, Lenovo TruDDR4 and DDR3 memory automatically assumes the system warranty, and Lenovo provides service and support worldwide. The x3950 X6 supports TruDDR4 memory operating at speeds up to 1866 MHz and DDR3 memory at speeds up to 1600 MHz. Note that even though supported TruDDR4 DIMMs are rated at 2400 MHz or 2133 MHz, when used in the x3950 X6, they operate at speeds up to 1866 MHz. The x3950 X6 supports up to 192 DIMMs when all processors are installed, 24 DIMMs per processor. Each processor has four memory channels that are implemented using Scalable Memory Interface generation 2 (SMI2) chips, and the server implements three DIMMs per channel. The processor and the corresponding memory DIMM slots are on the Compute Book. The following table lists the memory options that are available for x3950 X6. Mixing different types of memory (combinations of RDIMMs, LRDIMMs, and 3DS RDIMMs) is not supported. The maximum number of ranks per one memory channel is six with RDIMMs, 12 with LRDIMMs, or 24 with 3DS RDIMMs. In RAS (lockstep) mode, DIMMs must be installed in a pair. The maximum quantity of DIMMs that can be installed in the server depends on the number of processors, DIMM type, rank, and operating voltage, as shown in the "Max. qty supported" row in the following table. Lowest of maximum operating speeds for selected memory configuration that depends on rated speed, operating voltage, and quantity of DIMMs per channel, as shown under "Maximum operating speed" section in the following table. The following table shows the characteristics of the supported DIMMs. Tables cells that are highlighted with a gray background indicate that the server supports higher memory frequencies or larger memory capacity (or both) than the Intel processor specification defines. Memory speed: In performance mode, memory channels operate independently, and the SMI2 link operates at twice the DDR3 speed. In RAS mode, two channels operate synchronously, and the SMI2 link operates at the DDR3 speed. Chipkill and Redundant Bit Steering are supported in RAS mode. Chipkill is supported in Performance mode. If memory mirroring is used, DIMMs must be installed in pairs for Performance mode (minimum of one pair per each processor) and quads for RAS mode. DIMMs in the pair/quad must be identical in type and size. If memory rank sparing is used, then a minimum of two single-rank or dual-rank DIMMs must be installed per populated channel (the DIMMs do not need being identical). In rank sparing mode, one rank of a DIMM in each populated channel is reserved as spare memory. The size of a rank varies depending on the DIMMs that are installed. The server supports 1.8-inch solid-state drives in the SSD units and 2.5-inch SSDs and HDDs. Drives are installed in the Storage Book. The x3950 X6 has two Storage Books. The following figure shows these configurations. All standard models ship with four 2.5-inch SAS/SATA hot-swap hard disk drive bays. The following table shows the internal storage expansion options that are available. The backplanes are connected to one or two RAID controllers or HBAs depending on the number and type of backplane that is installed. The adapters are installed in PCIe slots in the Storage Book, as shown in the following figure. The following table shows the backplanes that are required per Storage Book and the number of controllers that are required. 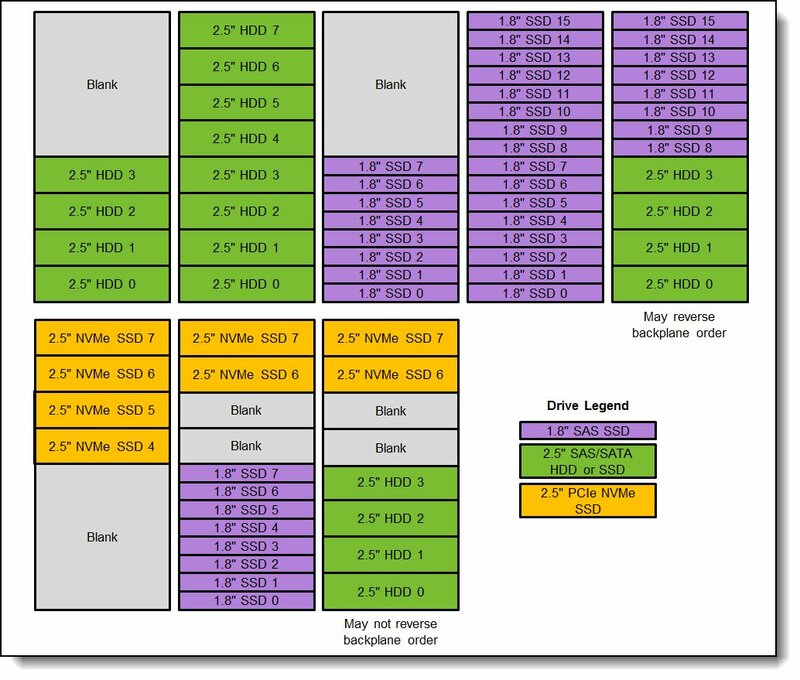 Note that the table shows the exact number of controllers supported for each drive/backplane configuration, no more, no fewer. * The number of controllers required is dependent on the number of drives installed: 1 or 2 drives requires one controller, and 3 or 4 drives requires two controllers. The following table lists the RAID controllers, HBAs, and additional hardware and feature upgrades that are used for internal disk storage. The adapters are installed in slots in the Storage Book. † Only one FoD key is required if the x3950 X6 is configured as a single image 8-socket server. If you partition the server into two four-socket servers, then two FoD keys are required. * These M5210 features upgrades require a cache memory upgrade (47C8656, 47C8660, or 47C8664). The following table compares the features of the supported controllers. The NVMe PCIe SSD Extender Adapter is a PCIe adapter that simply routes the PCIe 3.0 x8 signal from the slot in the Storage Book, splits the signal to two x4 links, and routes those via cables to the drive backplane. The extender adapter is shown in the following figure. One adapter is required for every two drives installed in the Storage Book. 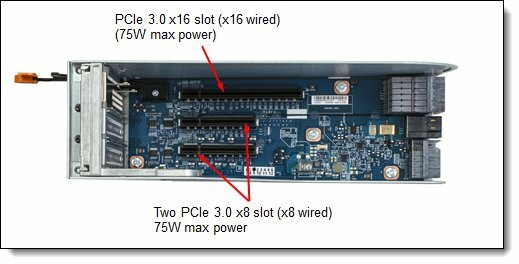 Since there are only two PCIe slots in the Compute Book, only two adapters can be installed and therefore only four NVMe drives can be installed in a Storage Book. The server does not support an internal optical drive option, however, you can connect an external USB optical drive. See http://support.lenovo.com/en/documents/pd011281 for information about available external optical drives from Lenovo. Four optional I/O Books, each with three slots, all full height. Optional I/O Books are hot-swap capable. The following figure shows the Primary I/O Book with the air baffle raised to show the internals. The adapters listed in the following table support hot-swap. * Hot-swap is only supported when the adapter is in pNIC mode. Hot-swap is not supported in either vNIC mode (Virtual Fabric mode or Switch Independent mode). The use of two Optional I/O Books requires six processors to be installed. The usage of all four Optional I/O Books requires all eight processors to be installed. The following table shows the ordering information for the optional I/O Books. The following figure shows the two optional I/O Books: the Half-length I/O Book and the Full-length I/O Book. The following figure shows the Half-length I/O Book. 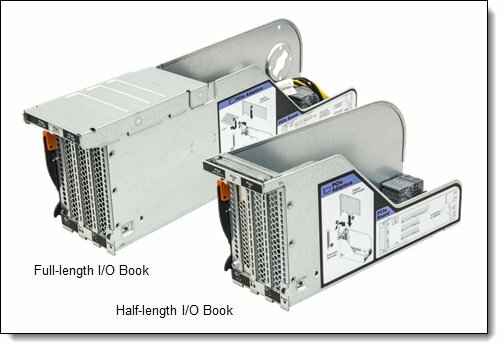 Each slot in the Half-length I/O Book and the Full-length I/O Book supplies up to 75 W of power. The combined power consumption of all the adapters that are installed in the Full-length I/O Book cannot exceed 300 W.
Note: The 2x3 connector is intended to be used only when one adapter is installed in the first x16 slot (the up-most slot in the following figure), either requiring 225 W or 300 W of power. The location of the 2x3 connector prevents an adapter from being installed in the other x16 slot. The Half-length I/O Book installs flush with the Primary I/O Book at the rear of the server. The Full-length I/O Book, when installed, adds a 99 mm (3.9 in.) mechanical extension to the base length dimension of the chassis. The following figure shows a Full-length I/O Book and a Half-length I/O Book installed in the server. 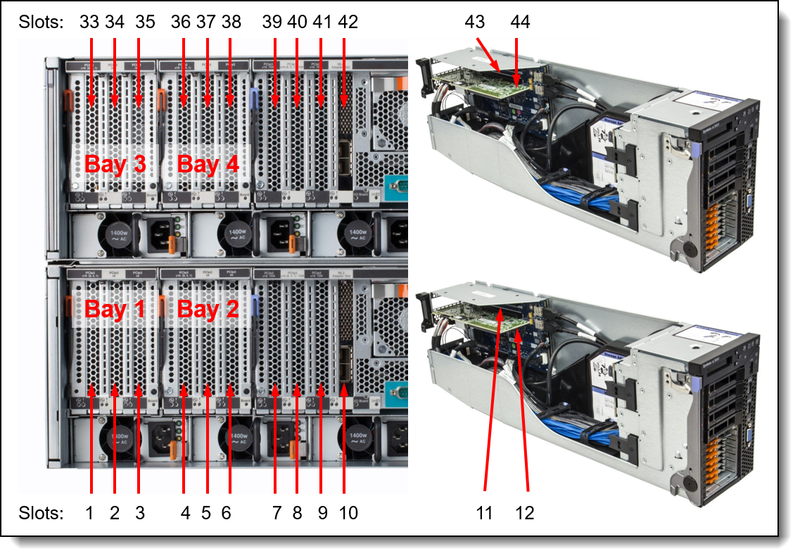 The slot numbering for the PCIe slots in the server are as shown in the following figure. The server supports ML2 adapters that are installed in the two ML2 slots, one in each Primary I/O Book. These ML2 slots support adapters with either two 10 Gb ports or four Gigabit ports and supports direct connectivity to the IMM2 service processor for out-of-band systems management. As listed in Table 2, all standard models of the x3950 X6 include an Intel I350-T4 ML2 Quad Port GbE Adapter (I350-AM4 based). The following table lists the supported ML2 adapters. The following table lists the supported ML2 adapters. ML2 adapters are installed only in the ML2 slots (slot 10 and 42 as show in the Slot locations section). The server also supports various other Ethernet, InfiniBand and Omni-Path network adapters, as listed in the following table. The maximum quantity listed is for configurations with all processors and I/O books installed. The maximum supported column also indicates which slots each adapter is supported in. For slot locations see the Slot locations section. For more information, including supported transceivers and cables, see the list of Lenovo Press Product Guides in the Ethernet Adapters category and the InfiniBand & Omni-Path Adapters category. The following table lists the SAS HBAs and RAID adapters that are supported by the x3850 X6. The maximum quantity listed is for configurations with all processors and I/O books installed. The maximum supported column also indicates which slots each adapter is supported in. For slot locations see the Slot locations section. Cache upgrade required: The ServeRAID M5120 SAS/SATA Controller ships standard without a cache. One of the available cache upgrades (81Y4487, 81Y4559, or 47C8670) is required for the M5120 adapter operations, and it must be purchased together with the controller. The following table lists the Fibre Channel HBAs supported by the x3950 X6. The maximum quantity listed is for configurations with all processors and I/O books installed. The maximum supported column also indicates which slots each adapter is supported in. For slot locations see the Slot locations section. All supported Flash Storage Adapters are now withdrawn from marketing. The server supports the co-processors and graphics processing units (GPUs) that are listed in the following table. Each is installed in a Full-length I/O Book. No other adapter can be installed in the Full-length I/O Book. The Full-length I/O Book includes the necessary auxiliary power cables. The maximum supported column also indicates which slots each adapter is supported in. For slot locations see the Slot locations section. 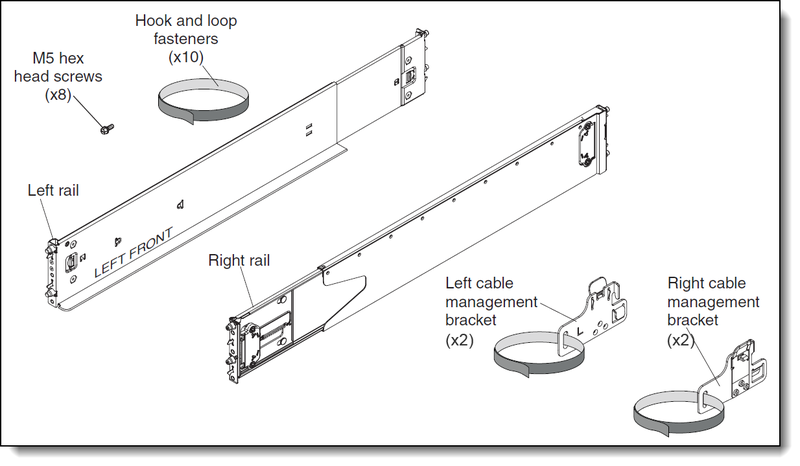 These adapters are not available through CTO and cannot be shipped installed in the server because they are installed in the Full-length I/O Book, which extends beyond the rear of the chassis (see Figure 12 in the I/O expansion options). These adapters must be shipped separately from the server. Order the adapter and Full-length I/O Book as separate options. If an NVIDIA GPU is installed, the maximum system memory that can be installed is 1 TB, however, it is recommended you have less than 1 TB of memory installed. See https://support.lenovo.com/us/en/solutions/ht114952 for details. † Not available through CTO. The x3950 X6 supports up to eight redundant power supplies. Standard models come with four power supplies (model dependent). The following table lists the power supplies. It is not recommended you mix the two 1400 W options (44X4152 for low altitude and 44X4150 for high altitude) as you will nullify the high-altitude capabilities of 44X4150. The server supports VMware ESXi that is installed on a USB memory key. The key is installed in a USB socket that is on the primary I/O book inside the server. The following table lists the virtualization options. † 2 hypervisor keys are supported only if the x3950 X6 is configured to be partitioned, where the two halves of the server operate as two independent four-socket servers. However, CTO orders can include only one hypervisor key. The server contains Integrated Management Module 2.1 (IMM2), which provides advanced service-processor control, monitoring, and an alerting function. If an environmental condition exceeds a threshold or if a system component fails, the IMM2 lights LEDs to help you diagnose the problem, records the error in the event log, and alerts you to the problem. The IMM2 also provides a virtual presence capability for remote server management capabilities. The blue-screen capture feature captures the video display contents before the IMM restarts the server when the IMM detects an operating-system hang condition. A system administrator can use the blue-screen capture feature to assist in determining the cause of the hang condition. 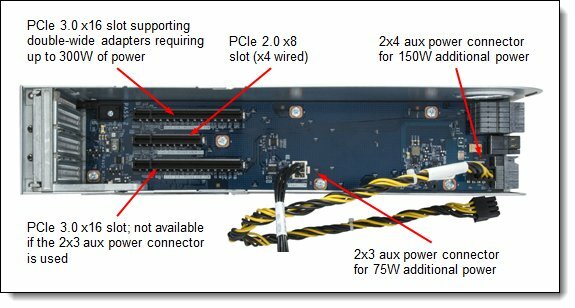 All models of the x3950 X6 include a rail kit and cable management bracket kit for installation in a 19-inch rack cabinet. The contents of the kits are shown in the following figure. Operating system support is based on the compute books installed in the server. Server on: 5 °C to 40 °C (41 °F to 104 °F); altitude: 0 - 3,050 m (10,000 ft). Server off: 5 °C to 45 °C (41 °F to 113 °F); altitude: 0 - 3,050 m (10,000 ft). The System x3950 X6, machine type 6241 has a three-year warranty. The following table lists the 6 Gbps SAS external drive enclosures that are offered by Lenovo that can be used with the server for storage expansion. The following table lists the 12 Gbps SAS external drive enclosures offered by Lenovo that can be used with the server for storage expansion. The server supports the rack cabinets that are listed in the following table.